Purchase your tickets today for the Ranch Hand Rescue 5th Annual Gala Event! Save the date for the biggest charity event of the season on Saturday, October 22nd at the DFW Hilton Lakes Grand Ballroom in Grapevine, Texas. This year’s Ranch Hand Rescue Fall Fundraiser is all about giving hope— Argyle Feed & Hardware is a proud sponsor of Ranch Hand Rescue and is again sponsoring a table at the 5th Annual Gala this year. We hope you plan to attend this fun and entertaining evening hosted by long-time DFW Sports Personality/RHR Goodwill Ambassador Mike Doocy along with Honorary Chairs Frenchy and Teri Rheault of Frenchy’s Lawn & Tree Service. Click here to order tickets now. Your ticket entitles you to a fabulous multi-course dinner, a glass of wine, beer or a soft drink, a multi-star studded show, silent and live auction and more. Attire, of course, is Glamour and Glitz! 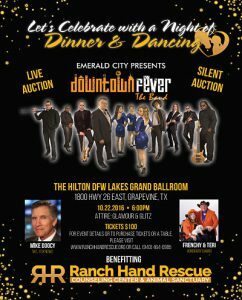 All proceeds from the 5th Annual Gala and Silent Auction benefit the very good work being done by Ranch Hand Rescue. A farm animal rescue organization founded in 2009 by Bob Williams, Ranch Hand Rescue provides shelter and rehabilitation for neglected and starving farm animals as well as Equine and Animal Assisted Therapy Counseling programs. We look forward to seeing you at this year’s Ranch Hand Rescue 5th Annual Gala Event! After suffering a stroke, Bob Williams knew he wanted to do something more meaningful with his life and established RHR in 2009 to save farm animals from neglect and starvation. Why a farm animal rescue? While thousands of animal shelters in the US are designed for cats and dogs, Bob recognized a void in facilities capable of sheltering farm animals. In response to that void, Ranch Hand Rescue was created. Currently, Ranch Hand Rescue continues outreach to develop a “foster family” network critical to expanding the group’s efforts. Since most of these animals are malnourished, they require special diets, supplements and periodic visits by a vet to monitor their progress. In many cases. it’s simply a well-managed feeding program with the proper nutrition, companionship & love that brings these animals back to a state of good health. All of the animals rescued by RHR are evaluated by a veterinarian, given appropriate vaccinations and treated for parasites before being transported to their new foster home. All progress with RHR foster animals are tracked and monitored by veterinarians and the animals’ foster families. The absolute worst cases are brought to Ranch Hand Rescue. In most cases. these animals require round the clock care and surgery. The foster family network gives RHR the ability to not only save more farm animals; it increases the opportunity to provide the immediate medical care and rehabilitation for the most severe cases care for at Ranch Hand Rescue. While rescuing farm animals continues to be at the core of Ranch Hand Rescue’s work, the organization has expanded its services to provide Equine and Animal Assisted Therapy Counseling programs which serve victims of child and sexual abuse, rehabilitate at-risk youth, and provide counseling for clients facing the challenges of drug and alcohol addiction, depression, anxiety, anorexia, and many other personal, mental, and physical challenges. This entry was posted on Wednesday, October 19th, 2016 at 4:52 pm	and is filed under Events, News & Updates. You can follow any responses to this entry through the RSS 2.0 feed. Both comments and pings are currently closed.